Annual, 10-40 cm tall, lacking a tuft of leaves at the base. Foliage covered with stiff, straight, long hairs, often arising from low bumps. Hairs are spreading or lay flat. Erect stems are simple or branched. Alternate leaves are linear to narrowly oval, 0.3-5 cm long, with entire margins. Small white flowers (1 mm across) with yellow throats in coiled flowerheads that tend to be paired. Each flower consists of 5 tiny petals that are fused at the base into a tube with 5 bulges at the throat. Flowerheads typically emerge somewhat above the leafier part of the plant. 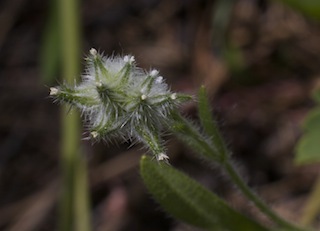 Hairs on the base of the petals (calyx) are more or less straight. 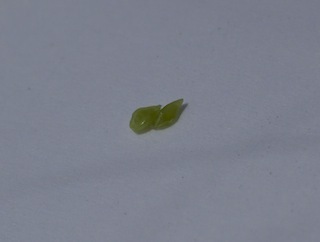 Small egg-shaped nutlets (1-2.5 mm) long, are smooth and shiny. Nutlets have a longitudinal groove down the center of the back side that forks near the tip. Nutlets are not compressed. Green calyx below the nutlets is 4-8 mm long, with stiff hairs that lay flat and spreading bristles. Dry to moist, sparsely vegetated soil of open forests at low to mid-elevations. Cryptantha refers to the presences in many members of this genus or flowers that never open and appear hidden. Species named after John Torrey, an American botanist. Some Cryptantha species were crushed and boiled by Native American groups for external use as a lotion for itching, boils, and fatigued limbs. 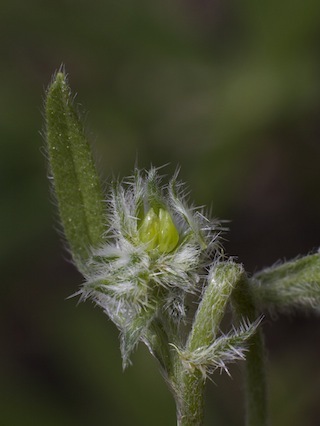 Cryptantha species are difficult to identify, often requiring examination of the flowers and nutlets using a strong hand lens or dissecting scope. Slender cryptantha (Cryptantha affinis), also an annual with no basal rosette, can be distinguished by its nutlets with a longitudinal groove that is off-center and closer to the edge. 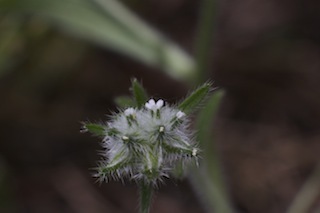 Sierra cryptantha (Cryptantha sobolifera) is a perennial up to 15 cm tall with larger flowers (4- 8 mm across) and nutlets that are bumpy with low ridges on the backside. Three other species in the borage family in our region also have white or yellow flowers. Scouler's popcornflower (Plagiobothrys scouleri) is a white-flowered, sparsely hairy plant found in drying mud around wetlands. Western gromwell (Lithospermum ruderale), is a perennial up to 60 cm tall with light yellow flowers and smooth, shiny gray nutlets that are very hard. Menzies' fiddleneck (Amsinckia menziesii) is a annual with bright yellow flowers with red-orange marks in the throat and irregularly shaped nutlets with a rough, bumpy surface.